Even though it might have been helpful if others had better understood what we were going through, and even though bringing a problem into the open can demystify and de-shame it, I’m still not sure I’m ready to look back on all that. Katie and John Kelly (Eliza Coupe and Steve Howey) are ready to settle down and have kids but five years later, all they have to show for their efforts is a mountain of negative pregnancy tests and an increasingly elaborate home micro-brewing rig, which John hopes will launch his company. As they run out of traditional options and their window closing, the couple explores the daunting world of medical, spiritual, and homeopathic methods to conceive a child. With an ensemble cast…MAKING BABIES puts a couple through the ringer [sic] of modern infertility treatments and questions whether their marriage will withstand the ultimate test. And then you lost me with this: Friend with rambunctious children says, “If it doesn’t work out I’ll give you one of mine” — such a low-hanging adoption punchline. For me, this comedy is a watch-on-demand-in-my-living-room movie. How about you? Do you plan to see Making Babies? What effect do you think this movie will have on people dealing with infertility? Ah well…it does address the topic directly. That’s more than most movies. Me, too! So I guess that’s not exactly a ding against this movie. I don’t think I’ve watched a movie with an infertility element since we decided to go child-free. I wonder how I’d feel now. PS I’m emailing you in a minute. If you see the movie, I’ll be curious what you think. I’m really on the fence with this one. On one hand, good for bringing the topic to the general public. On the other… not all publicity is good publicity. There’s something about it that makes me wonder how sensitively they’ll portray the situation, but I can’t name what that “something” is. I understand your dilemma — it’s mine also. Great post … I share your trepidation. Bottom line, tho, I do want to see it and hold my comments til then. My favorite movie that depicts the pain and drama of infertility was from the 1990-era film “Immediate Family” with Glenn Close and James Woods. So many great vignettes that I remember to this day. It hit the theaters when I was immersed in my own parallel drama and it gave me comfort that I wasn’t crazy. Best case scenario, today’s film helps an audience viewer like Immediate Family helped me. I’ll add Immediate Family to my queue. Thanks, E! I don’t think I can watch it. A lot of it is still till too present in mind. We went through different methods and we used alternative an family building option to grow our family but I still cry when I see someone else’s negative pregnancy test when I know they want it so bad. No, I won’t be watching it. My infertility is still painful for me even though I am now past the age of child bearing years. I can feel the pain of another person who is going through infertility like it’s my own even after all of these years. I think for me seeing this would be like taking a scab off an old wound. Hard pass here. We didn’t even do fertility treatment, but I have no desire to watch a “comedy” about trying to create a family. We’ll just watch Finding Nemo for the millionth time and I’ll enjoy being Momma to my greatest blessing. 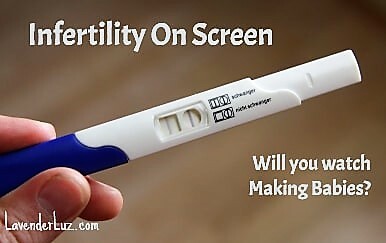 I don’t understand why anyone would find infertility funny. Nope, nope, nope. I feel like maybe I would watch it on my tv so I could turn it off at will, but it also seems like while it has some decent reality to it, I will probably be filled with fury with some of the comments made. HAHAHA, you can have one of mine, HAHAHA. Never funny. I do enjoy the scary sample room, But I am often irritated at how even well-meaning movies and TV portray infertility and pathways to resolution. Usually there’s either trite stereotypes or inaccuracies, and almost always there is either a surprise miracle baby or an easy, convenient and glossed-over adoption scenario, both of which support either the “it will happen if it’s meant to/you never know…” and the “just adopt” tropes. Blech. It looks like maybe it has promise and I appreciate the effort to put something out that reflects an increasing number of peoples’ experience, but it just seems that soooooo much could go wrong, and do more harm to our community than good. Hi, found your post through stirrup queens’ #MicroblogMondays. Can I just say I have never heard of this movie? where have I been? I’m gonna watch the trailer on youtube now. Oh good grief! I’ve just watched the trailer, and they’ve hit all the cliches – “have you thought about …”, “have one of my kids …,” “maybe you’re not meant to have kids,” etc etc. But not in a good way. Not in the way of showing how hurtful those comments can be. I may watch this on demand in my living room out of curiousity. But whereas the Paul Giamatti Kathryn Hahn one … hang on, I’m googling it … Private Life, was rather more sensitively handled, this looks as if it is just being played for laughs. Yes, because infertility is so damn funny. Or it is to people who’ve never experienced it. So right now, I want to avoid it at all costs. I still steer clear of infertility and adoption in movies. Yeah, that about sums up my stance.